A couple of stories about this popped up in me RSS reader over the last couple of days. I think this is great. Actually I want to say its about time. There are many many great apps developed for the iPhone but there are not a lot of apps that try and re-work the existing status quo. One great example that I can think is is the Mobile Starbucks payment application. The app allows you to add money to your card and to show a bar code at check out and have the card debited. When I go to Starbucks I would estimate that at least half of the people in line use it if not more. Starbucks also created versions for Android. It does not slow the line down and its super easy. Its hard to throw a rock today without hitting a person using an smartphone let alone an iPhone. I would like to see more real world ways that people can use their phones to make the user experience better. Our nation’s rail system is about to take a big step forward by placing less emphasis on paper tickets and introducing the iPhone as an important tool for conductors. The New York Times has a story on Monday about the ongoing trials in which Amtrak is using the iPhone as a ticket scanner and a more efficient way of boarding passengers and filling in empty seats. 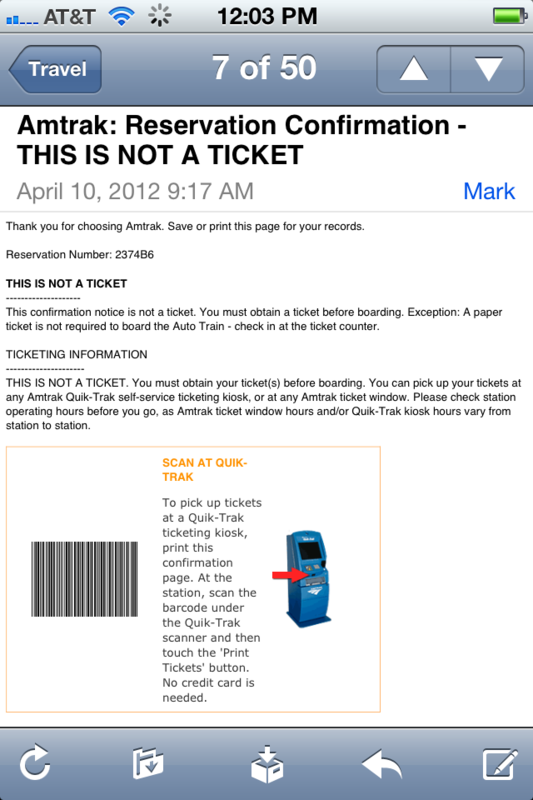 The report says Amtrak has been training conductors since November 2011 to scan tickets with the iPhone. It’s only been active on a few routes — between Boston and Portland, Me., and from Sacramento to San Jose, Calif. — but they’re planning to expand. This might sound simple and not totally novel; there are local metro systems like Boston’s MBTA that are about to start using smartphones as tickets. But as I’ve recently learned, this is a welcome improvement for the tens of thousands of people that commute daily or often travel by rail. Amtrak isn’t a factor in people’s daily lives in places I’ve lived like San Francisco or Los Angeles to the same degree it seems to be in the Northeastern Corridor. Since moving east I’ve become acquainted with Amtrak commuting between Philadelphia, New York City and Washington, D.C. What has most surprised me about rail travel has been how truly old-school it still is. Yes, it’s a transportation technology first invented almost 200 years ago, but it seems little progress has been made in terms of administration and passenger logistics. I can buy an Amtrak ticket online, sure. But when I get a ticket confirmation email with a bar code, I can’t just walk up to a kiosk at the train station and scan the code from my iPhone’s screen — I either have to print the bar code or swipe a credit card. But the thing that needs the most improvement is what happens once on board: conductors still physically punch your ticket once you’re seated. He or she then pockets your ticket stub before you get off the train and sends them to a central location. With the new iPhone-powered system, conductors can monitor passenger check-ins in real time. That will help them manage seating: if there are passengers who don’t show up, for example, it will be easier to fill empty seats with other passengers. “When it was all a manual system there was a lot of guesswork involved,” said Patricia Quinn, executive director of the Northern New England Passenger Rail Authority, which contracts with Amtrak to operate the train service from Boston to Portland. This is great news for Amtrak — though it will cost the agency $7.5 million for the hardware and software to institute the new process. But it should also make life easier for passengers, which is why I’m so eager for late summer: that’s when Amtrak says the devices will be rolled out across the country, to more than 1,700 conductors.